Pueblos . 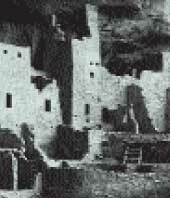 . . cliff dwellings . . . churches . . . forts . . . these and other ruins are rapidly disappearing from the arid West. Built of stone, wood, or earthen block, they reside in parks, historical sites, and national recreation areas. The variety of settings, in fact, may create a dilemma for the land manager. The remains of a ranch or mine may be in a park established to protect its natural resources, like a Grand Canyon. Getting preservation money, given the park's reason for being, can be a challenge.